An Asian delicacy that consists of a whole egg containing a duck or chicken fetus. Unlike a traditional egg that has not been fertilized which contains only the white and a yolk, Balut is an egg that has matured for approximately 17 to 21 days so the embryo of the chick begins to form within the shell. When ready for use, the Balut is prepared by boiling the egg and then eating the broth within the shell before consuming the young chick. Once cooked, the bones of the chick become tender and easily edible. 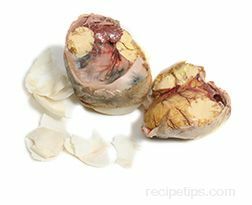 Served in China, Cambodia, Philippines, and Vietnam, Balut is typically eaten as a snack or appetizer.